The fishers’ legendary finesse and techniques were witnessed and reported by Lewis and Clark and other early explorers and settlers. Wood scaffolding would be constructed as platforms along the shore for fishermen harvesting spawning salmon with long-handled dipnets. Another method used was spearing the fish from small boats. In 1855, the Nez Perce, Umatilla, Yakama and Warm Springs tribes signed a treaty with the United States government to reserve, forever, their right to fish at all of their usual and accustomed places. The rich custom of tribal fishing continues to be essential to the heritage, culture and economy of the Indian people and to the Pacific Northwest. We invite you and your family to this unique, cultural event and to experience the tradition. Learn about opportunities to buy fresh salmon directly from tribal fishers from fishing sites throughout the Columbia River Basin. 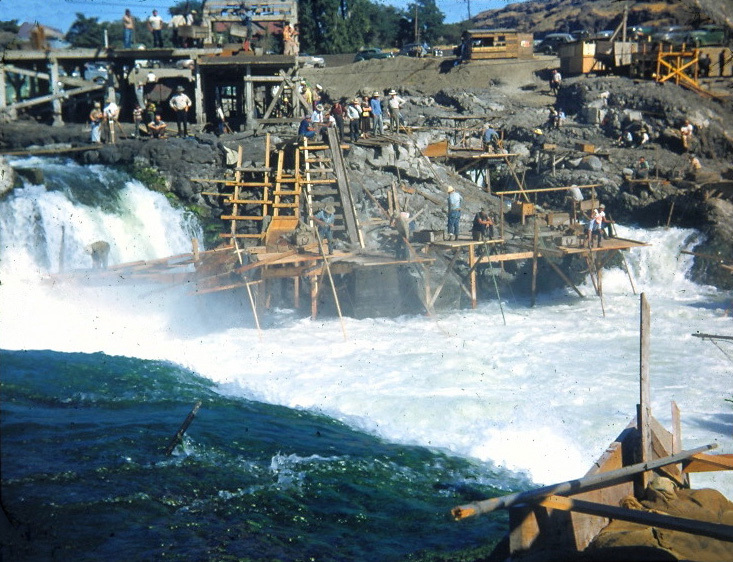 Up until it was flooded in 1957, Celilo Falls attracted people from throughout the region to buy from or trade with the Indian fishers’ catch of salmon.